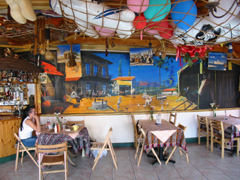 Try all styles of Mediterranean and Mexican cooking in this friendly bar restaurant. The menu ranges from light bites like Nachos with cheese and salsa (£3) to French style sirloin steak (£7.90). The pint of beer cost £2 before 10 pm. With three separate rooms, delightfully decorated Ahir is the perfect party venue. The rooms could be separated for individual bookings or joined together to host a large party. Ahir also has its own entertainments details of which can be found in its web site. The basis of the Mediterranean diet is simple indeed - bread, pasta and their derivatives, olive oil, wine, sun-ripened fruits and vegetables, fresh meat and fish, herbs and spices. When combined these humble ingredients yield rich dishes of unparalleled taste. Its clear, robust flavors and uncomplicated preparations make the dishes here a number one favourite.